In the history of courageous activism against Tyranny and Evil, the story of the White Rose Resistance to Nazism is truly Awesome! Brave Young Souls whom were Murdered by The Nazi state for their Defiance of Hitler’s Infernal Rule. On 18 February 1943, coincidentally the same day that Nazi propaganda minister Joseph Goebbels called on the German people to embrace total war in his Sportpalast speech, the Scholls brought a suitcase full of leaflets to the university. They hurriedly dropped stacks of copies in the empty corridors for students to find when they flooded out of lecture rooms. Leaving before the class break, the Scholls noticed that some copies remained in the suitcase and decided it would be a pity not to distribute them. They returned to the atrium and climbed the staircase to the top floor, and Sophie flung the last remaining leaflets into the air. This spontaneous action was observed by the custodian Jakob Schmid. 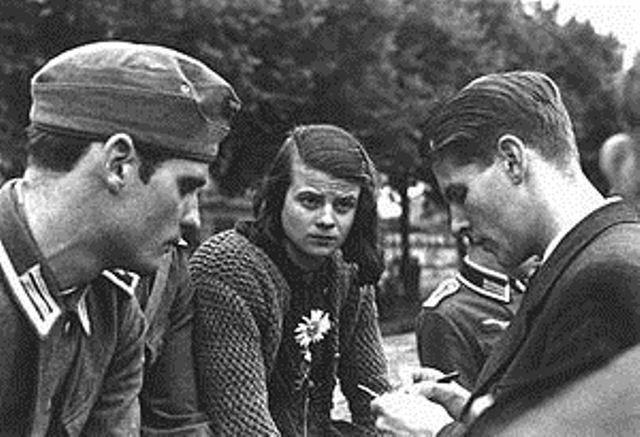 The police were called and Hans and Sophie Scholl were taken into Gestapo custody. Sophie and Hans were interrogated by Gestapo interrogator Robert Mohr, who initially thought Sophie was innocent. However, after Hans confessed, Sophie assumed full responsibility in an attempt to protect other members of the White Rose. Despite this, the other active members were soon arrested, and the group and everyone associated with them were brought in for interrogation. When Hans was executed, he said “Let freedom live” as the blade fell. Nice post Tim. I’ve had the movie – Sophie Scholl: The Final Days – on my wishlist to watch for a long time. Must get around to it soon.